Oh how quickly time flies, for it is already the fourth day of the Nine Emperor Gods Festival 2012. Next in line of the 3Ses is the smell associated with the festival. 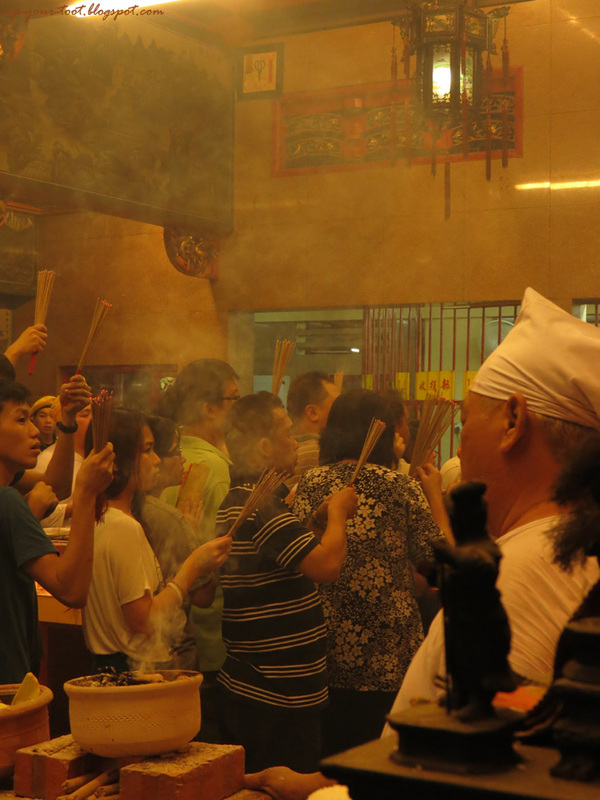 Firstly, there’s the scent of joss-sticks. The whole temple is permeated with this thick, smoky smell that is acrid and will make your eyes sting and your throat irritated. The temple is thick with the smell of joss-sticks and sandalwood. More than enough to make you cry and your throat dry. Yet the festival would be incomplete without this smell. Faring slightly better than the smell of incense would be the smell of sandalwood. At least it is pleasantly aromatic, though standing in front of the sandalwood urn is an invitation for dry throat and stinging eyes. 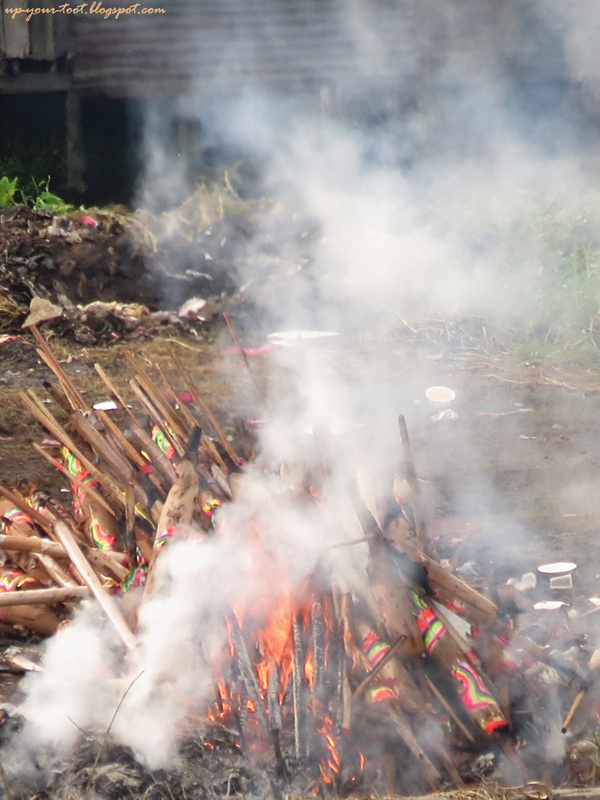 Behind the parking lot is a pit where all the discarded joss-sticks and unclaimed joss papers gets unceremoniously burned to ashes. 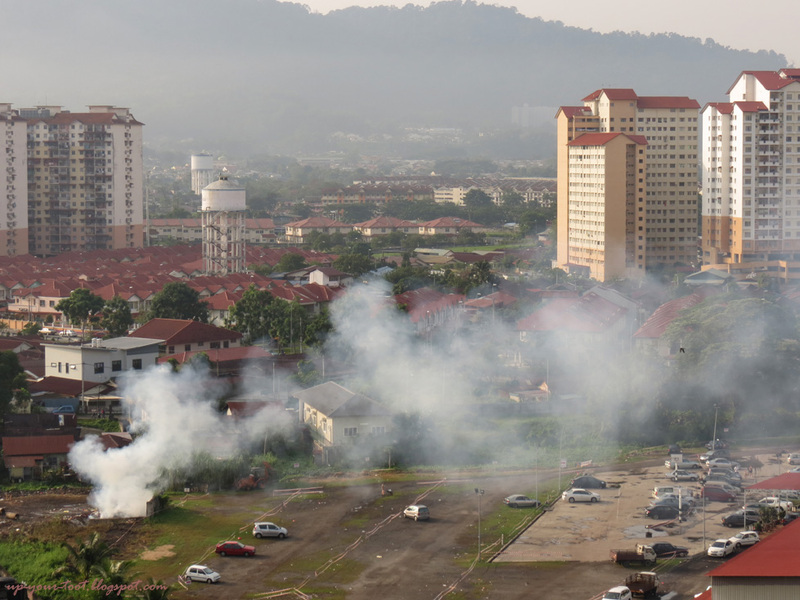 Then there is the ubiquitous smoky burnt smell contributed by the continuous burning of joss paper and also the joss sticks that were collected and then dumped on an open burning pit. This leaves a smoky smell in your hair and clothes like you’ve just walked out of a burning house. The final resting ground for the dragon joss-sticks. This contributes to the 'burnt out' smell that pervades the area during this festival. Another interesting smell that you will encounter is the smell of Chinese chestnuts being fried in large huge woks. The addition of sugar to the frying mix and the caramelisation of this sugar give the smoke from the roasting/frying process a nice sugary feel to it. 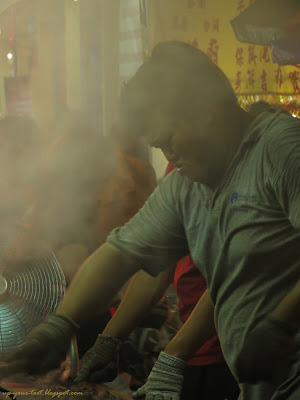 A man frying Chinese chestnuts...Expensive, but a rather popular snack with visitors. A fan is used to drive the smoke away. Next is a smell that will make some people balk at the thought of eating it – the smell of stinky tofu. This year, there are six, yes SIX stalls selling stinky tofu. They smell bad, especially when they have just hit the hot oil in the wok and the heat drives the moisture and smell out. But once fried, and together with a tangy, spicy sauce, they are quite addictive and the long queues to buy them attest to their popularity. Stinky tofy being deep fried. They smell the worst at this stage. After cooking, they are actually quite mild, like a rather strong cheese. I occasionally can smell the stinky tofu smell from down the road and thirteen floors up! 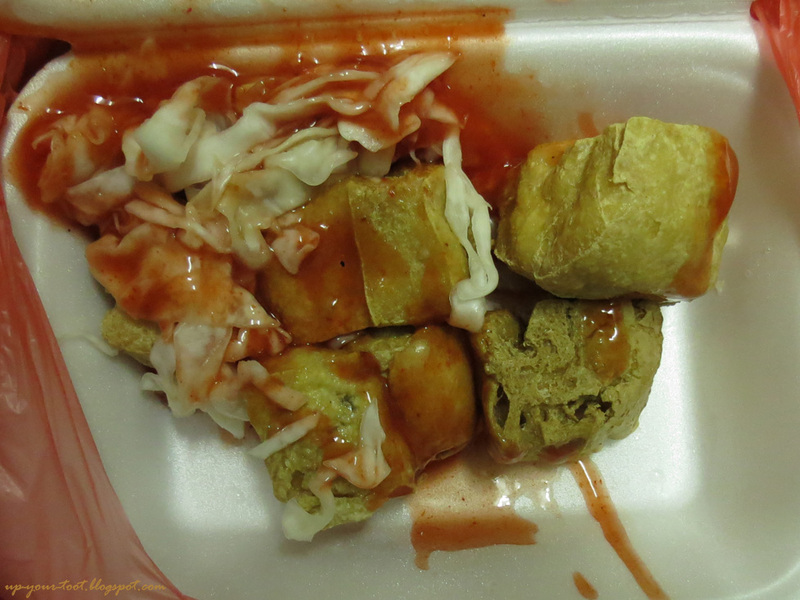 Four pieces of stinky tofu with a tangy chilli sauce cost RM 3.20. Not bad for something that smells foul when put into a wok of hot oil. One of the 6 stalls that sell stinky tofu. This one even sells fried Durians. 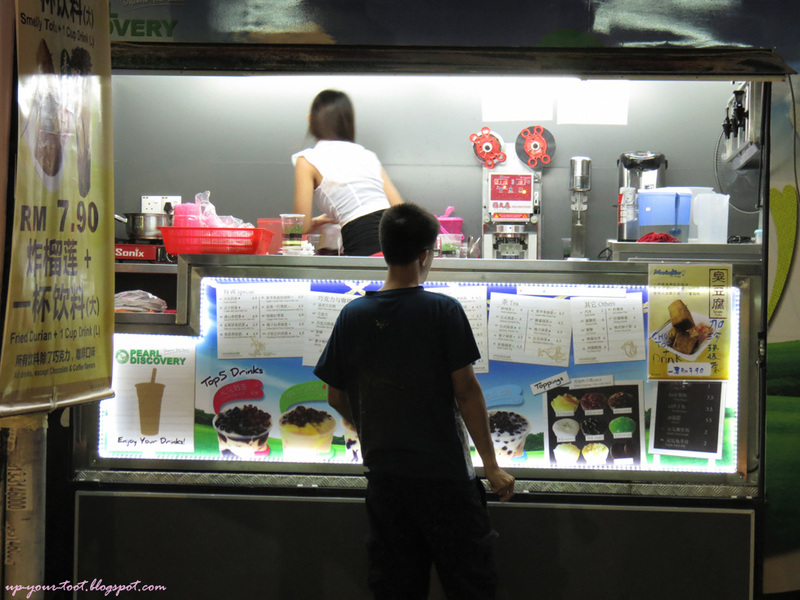 They have combo sets where you can get a drink with your stinky tofu or fried Durian. Less odourous than stinky tofu but might still turn someone off is the smell of fried cempedak, or jackfruit. The ripe fruit has a smell that is reminiscent of bottled cooking natural gas, and when fried, this smell is pretty strong. There is also two stalls selling fried durians, but I could not detect the signature smell of durian emanating from these stalls. 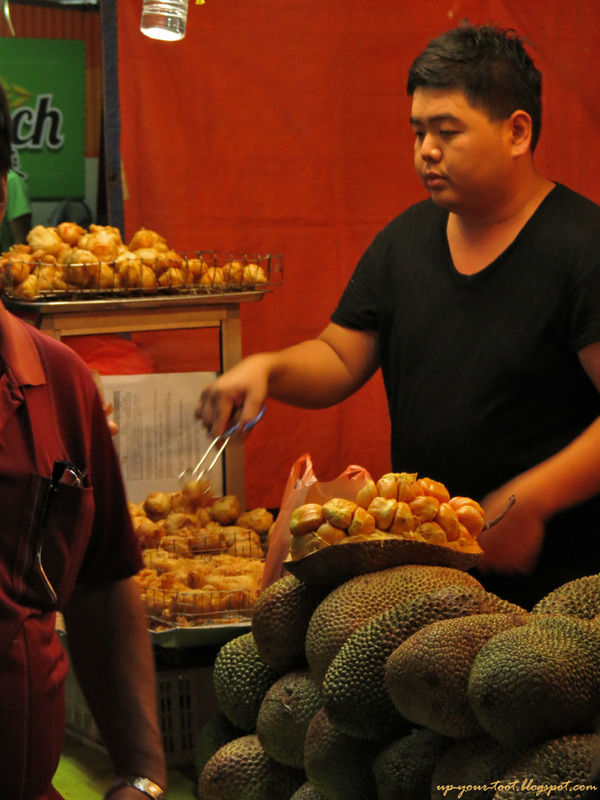 A fried jackfruit (Cempedak) stall. 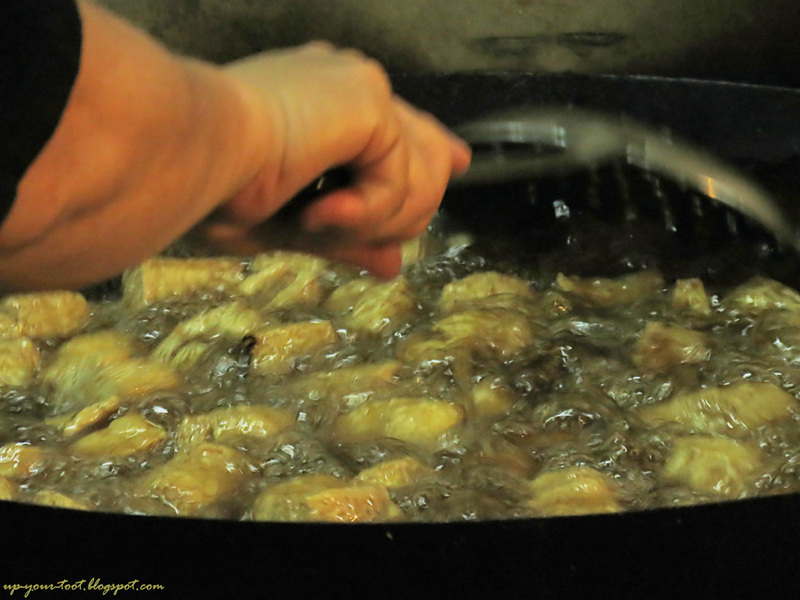 The smell of battered and fried Cempedak is unique. So when you do visit this festival here in Ampang, let your nose be your guide, hopefully to what you like to see and eat.